It takes the skill of an exceptional artist to transform as rich a material as this, using the different planes of color in contrasting layers to create a coherent and successful work of art. 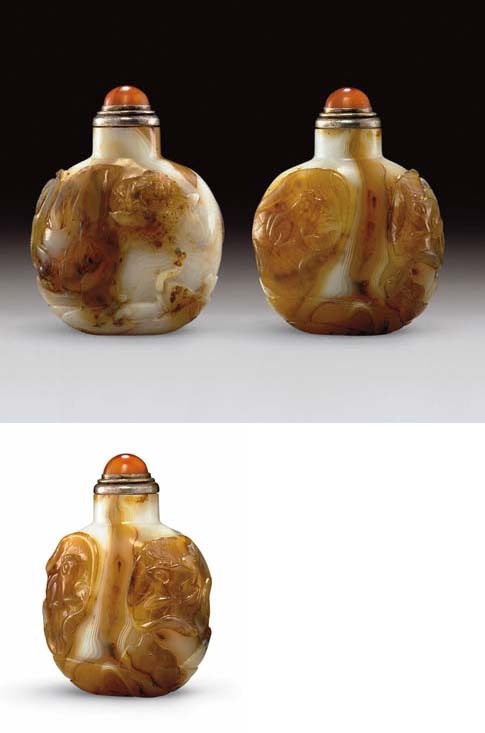 Another successful transformation of similar material is seen in an example formerly in the J & J Collection, sold in these rooms, 30 March 2005, lot 69 and illustrated by Hugh Moss, Chinese Snuff Bottles of the Silica or Quartz Group, front cover and p. 67, no. 75. Liu Hai is the immortal associated with commercial success. He is nearly always portrayed with his three-legged toad and cash, and conveys a wish for prosperity. The three-legged toad itself has origins in the magical realm, representing the unattainable. It was only in later Chinese art that it was associated with Liu Hai. The toad (chan) together with the lotus (lian) forms the homonym chanlian, a term signifying success. The bottle thus carries numerous wishes for riches and good fortune.